We were delighted to welcome Karolina Baker for a week-long work experience placement at EM Analytical last month. Karolina is about to start her final year of a BSc Molecular Biology course at the University of Manchester, and wanted to gain some experience of working in a commercial lab. From day one, Karolina was keen to get stuck in. She got involved with all aspects of the wide variety of work we do here at EM Analytical. Step one is the project proposal, outlining how we plan to deliver the results our clients need. We deal with all sorts of research and development topics, so it’s important to quickly absorb new information and cut to the heart of the problem. We discuss our clients’ research questions with them and quickly put together a clear roadmap to help find the answers. Karolina then went on to do the microscopy work itself. 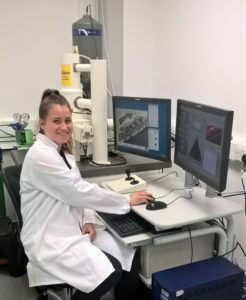 This included everything from analysing metallurgical samples for defects, to trying out our new Axiovert 200M fluorescence microscope inspecting the auto-fluorescence of yeast. It can sometimes take a while to fully understand what you’re looking at, but that’s all part of the fun! We then performed detailed image analysis to quantify our findings. Finally, Karolina saw everything come together in the project report. We make sure our data is presented in a way that is clear and easy to understand. Our reports not only answer our clients’ original question, but also suggest further improvements and topics for their research. We wish her all the best for her final year!